Charlie Faye & the Fayettes either have potential, or their potential’s already been realized. After two albums, it’s honestly hard to say, but I lean toward the former. So far, the Austin vocal trio has a basic wheelhouse they’re content to stay in: retro ’60s girl-group nostalgia, with a few appropriate variations that fit both that sensibility and Faye’s pipes. And their second full-length album, The Whole Shebang, shows Faye, BettySoo and Akina Adderley are more than competent at it. Yet, there are moments when Eric Holden’s production is too polished, giving The Whole Shebang a sometimes grating quality that hurts its re-listenability. Still, this inconsistent album doesn’t hurt for fine moments. “I Don’t Need No Baby” is a not-so-subtle modern-woman revisit of “Be My Baby,” complete with the drum riff at the beginning so there’s no mistake about what they’re going for. It works, and so does title track “The Whole Shebang,” one of a couple expansive midtempo-ballad moments here that are reminiscent of fellow retro-mongers the Noisettes. “Stone Cold Fox” lets Faye loose by successfully mixing in some hard country. “The Cream Rises to the Top” has a dark guitar reverb lurking beneath the Fayettes that balances their high-register vocal sugar, making it sound like a dark-horse candidate for a Quentin Tarantino film soundtrack. And while it’s not necessarily the best song on the album, “That’s What New Love is For” may be the best representation of the group’s wheelhouse — straight late ‘50s/early ‘60s balladry, with plinking piano, smooth horns, and Faye palpably conflicted about whether the fire has left her romance. 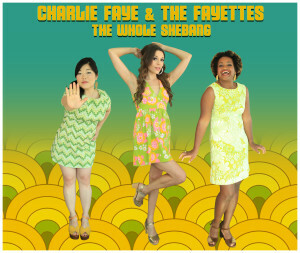 The album’s weakest moments come when it sounds like you’re listening to CHARLIE FAYE and the Fayettes. That’s not a criticism of Faye’s voice, but of the production; her pleasantly high, straight-out-of-1962 vocals are often placed too high in the mix, giving too many tracks an overproduced, showbiz-y feel. Not all the songwriting is on point, either; opener “1-2-3-4” is a lyrically trite throwaway, and “Baby We’ll Be OK” is a social-comment song that doesn’t quite coalesce, with Faye’s pleas for reassurance not meshing with the track’s whimsical feel. Like many groups that use a fairly specific slice of rock’s past as their starting point, it’s worth wondering, after two albums, where the Fayettes can go from here. Or will they just stay in that wheelhouse and just stick to the music they love? Even if they do, The Whole Shebang suggests they’ve got the chops and the skill to keep churning out good ones, and simultaneously suggests they’re capable of an even better album.